3/8" x 25' Flex Shaft with Protective Covering. Use a cordless drill with an adjustable clutch to operate. The 3/8" x 25' Flex Shaft includes Medium Chain Heads for both Roots and Grease. 3/8" Medium Grease Chain Knockers for cleaning grease and soft buildups out of 3" and 4" pipes; used for PVC, ABS, orangeburg, corrugated, clay, copper, galvanized, and cast iron pipes. 3/8" Medium Chain Knockers for roots and other tough buildups out of 4" and 6" pipes; used for clay, copper, galvanized, and cast iron pipes. Use with caution on PVC, ABS, orangeburg, and corrugated pipes. The 3/8" Flex Shaft gives you the ability to go through a 2" opening to clean out a 6" line. 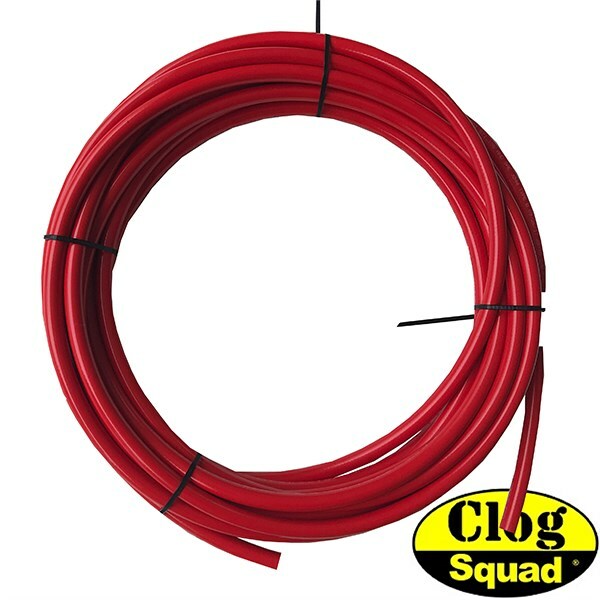 The same size Flex Shaft that's in the Large Clog Dog, this is perhaps the most versatile of all our products. Adjust your chain heads to clean 3", 4" or 6" lines. 3/8" x 25' Flex Shaft includes Medium Chain Heads for both Roots and Grease.